If you’re new to bingo, whether land bingo or online, you’ve no doubt noticed that it’s a special world. Even if you’ve been playing bingo forever, you might just come across a bingo hall or website that uses words you’ve never heard.Lucky for us, the special language of bingo doesn’t take years to learn. And there’s no need to use Google Translate! Just take a look at Winkly’s ultimate bingo dictionary, and you’re likely to find everything you’ve ever needed to know. A variety of bingo played on a square-shaped card with 5 rows of 5 columns each and a free square in the centre of the card. The columns are labelled with the letters B-I-N-G-O and include possible numbers of 1 through 15 in the B column, 16 through 30 in the I column… up to 61 through 75 in the O column. A player wins a game of 75-Ball Bingo when he or she completes a pre-announced pattern on the bingo card (with literally hundreds of winning patterns available!) 75-Ball is the most popular form of bingo in the United States and Canada and has also gained popularity on online bingo sites all over the world. To learn loads more about 75-Ball Bingo and to see how it stacks up against its 90-Ball counterpart, check out our full 90-Ball vs. 75-Ball Comparison. TG refers to the number of squares a bingo player has to fill on his or her ticket before winning a game. So, as you can imagine, 1TG means “one-to-go,” and 2TG means “two-to-go.” These terms are used commonly in bingo chat rooms as the excitement about winning a game begins to build. Of course, it can be frustrating to almost win… Especially if it feels like it happens all the time. To keep things more interesting, lots of bingo sites have started designating certain games as 1TG and 2TG games. These games allow players to win prizes even when they have one- or two-to-go before an actual win. Hmmm… I wonder if there are prizes available for two-to-go to 2TG! Don’t be fooled by appearances! 5-Line Bingo may look a lot like its 75-Ball cousin, but it’s actually a lot more similar to 90-Ball. Also known as Swedish Bingo, 5-Line Bingo is a fast-paced game offering 5 chances to win: the first win for any one line, then any two, any three, any four, and finally (surprise, surprise!) any five lines – also called a Full House. (Depending on where you play, the winnings may increase right along with the number of lines completed.) The game is played on a bingo card laid out like American 75-Ball, but it doesn’t have a free square in the centre. You don’t have to travel to Sweden, eat meatballs, or shop at IKEA to play 5-Line Bingo. With its speedy pace and lots of opportunities to win, 5-Line Bingo is starting to become popular on bingo websites all over the world – especially among avid players looking to mix things up a bit. The most popular form of bingo by far in the UK, 90-Ball Bingo is played in 3 rows of 9 columns each. There are 5 numbers and 4 blank spaces in each row, with a total of 15 numbers on each card. It’s usually played in strips of 6 cards each, with all of the numbers from 1 to 90 appearing exactly once on each strip. Each game of 90-Ball Bingo gives players three different chances to win: the first win for filling all 5 numbered squares in any one line straight across, the second for completing two lines, and the third for completing all three lines (usually called a “Full House”). Check out our in-depth 90-Ball vs. 75-Ball Comparison to learn all the ins-and-outs of 90-Ball Bingo and to find out which form of bingo reigns supreme. Admission refers to the minimum number of cards you need to buy in order to enter a bingo hall (in land-based bingo) or play in a specific game (in online bingo). These requirements can vary significantly from hall to hall and website to website. To enter a bingo hall, admission may not simply involve the purchase of a minimum number of tickets in any combination, but often requires the purchase of a specified admission pack. A pack of bingo cards that is purchased to enter a bingo hall. Admission packets vary widely among bingo halls, but they often contain three to six tickets for every game in a bingo session, and sometimes tickets for special games as well. Purchasing an admission packet is generally required in order to enter the bingo hall and participate in the games. Occasionally, instead of requiring the purchase of a packet, a hall may simply include in the pack special games that are available only to players who purchase one. A feature of some online bingo sites that automatically marks called numbers on a player’s bingo cards during game play – making it easier to play multiple cards at once and never miss a call. A popular type of community fundraiser (often held by churches, fire departments, and other charity organizations) in which bingo players win prize “baskets” containing various types of prizes. These prizes could include any range of options: gift items, gift cards, gourmet foods, etc. And sometimes, the prizes are actually baskets! A bingo alias (or “nickname”) is the name a player gives himself or herself when she creates an account on a bingo website. In order to protect the player’s privacy, this is the name that other players see when he or she wins a game or is online in the chat rooms. 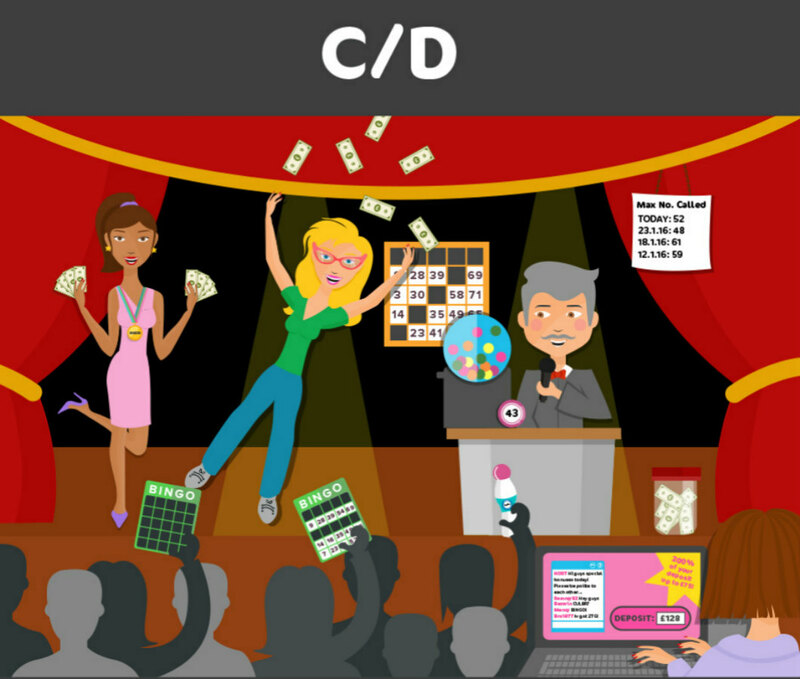 A creative alias can show a bingo player’s creativity and personality (and sometimes superstitions). So who knows? When you’re chatting in a bingo chat room with BingoPrincess#1, you might actually be chatting with a princess! A large board (usually electronic) at the front of a bingo hall that displays the numbers that have been called during a game. Online bingo rooms usually have an equivalent – a section of the screen dedicated to showing the numbers that have been called during the game. A slew of different types of bonuses offered by online bingo sites to their players. These can include bonuses designed to entice new players to the site, bonuses to encourage initial and/or re-funding of an online bingo account, bonuses to reward referring friends to the site, and more. Most bingo websites make a distinction between bingo bonuses and instant game bonuses – the former being bonus funds available only for playing bingo games, and the latter being bonus funds available only for playing the different types of instant games available on the website. 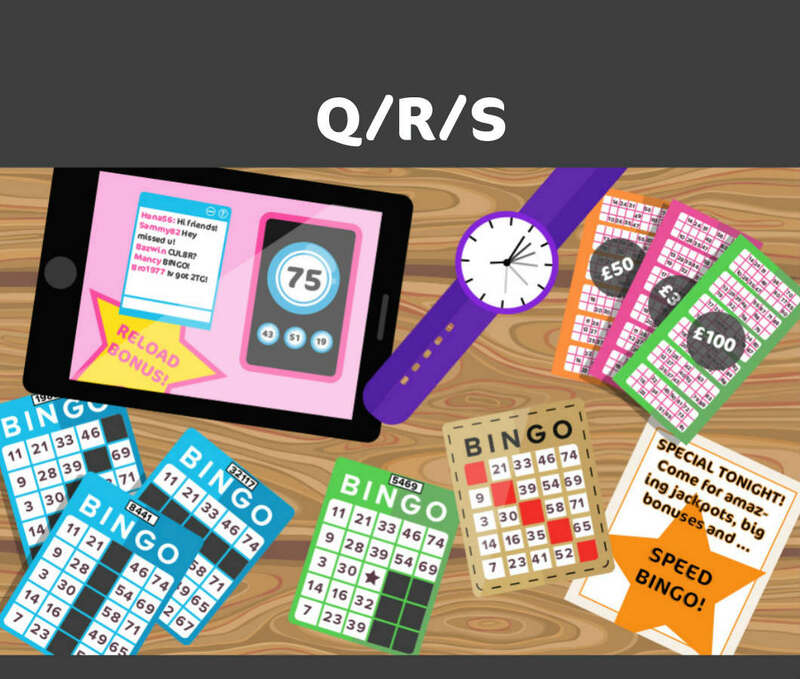 For more details on the types of bingo bonuses you are likely to encounter along the bingo road, check out A Journey to the World of Online Bingo Bonuses and Promotions. A group of bingo sheets bound together to be played in a single session (one sheet per game). Often (but not always), each sheet has a different colour, allowing it to be easily identified and matched to the relevant game. An individual game grid on which bingo is played. In 90-Ball Bingo, a bingo card is 3 rows long by 9 columns wide and contains 15 numbers (from 1 to 90). In 75-Ball Bingo, a bingo card is 5 rows long by 5 columns wide and contains 24 numbers (from 1 to 75) and a free space in the centre. For land-based bingo, different styles of bingo cards are available. Most commonly now, cards are printed on paper sheets (also called flimsies) and bound together in bingo books of various formats. Manufacturers often print bingo cards in series of 6,000 or 9,000 unduplicated cards, each identified by a number that allows for easy verification of the winning numbers. In online bingo, games are played on the digital equivalent of bingo cards. Bingo sites vary widely in the way players purchase cards: some give players the option to select their own cards; some issue randomly-generated cards; and some issue randomly-generated cards but allow players to change to a different randomly-generated set if they don’t like the cards they’re issued. The generally-accepted (but usually unwritten) rules of behaviour that govern the way bingo players interact with each other and the house. For land-based bingo, these generally include rules such as maintaining quiet while numbers are being called, not repeating numbers as they are called, and smoking only in designated areas. For a nice summary of land-based bingo etiquette, click here. 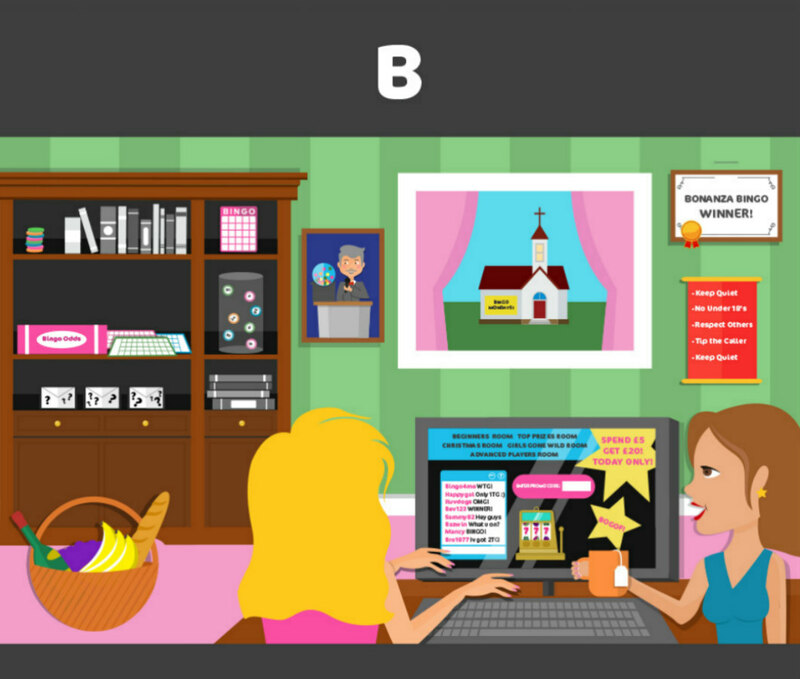 In the online bingo context, the rules of bingo etiquette generally involve the ways players interact with each other and with the chat host in the chat rooms. Click here for some useful online bingo etiquette tips. A land-bingo club in which bingo is played – often for cash prizes. In the UK, they are mainly run as commercial enterprises, while in the U.S., they are dominated by local charity organizations, churches, and Native American casinos. Bingo halls in the UK came into existence following the passage of the Betting and Gaming Act of 1960. While still extremely popular today, bingo halls have suffered a decline as a result of online bingo’s growth and immense popularity. For fact-filled history of bingo in the UK, including lots more about bingo halls, check out Carolyn Downs, A Brief History of Bingo. The nicknames callers use in the UK to refer to bingo numbers as they are drawn. Some of these calls date back to pre-WWII, and most rhyme with the number of the ball being called. For a full list of the traditional calls, see Bingo Calls. In 2003, Butlins holiday camps reinvented bingo lingo to include references to more modern pop culture. Take a look at Winkly’s It’s B4, Not Before. We Speak Bingo Here! to make sure you are hip to the jive. The tool used to mark called numbers on a bingo card as the game is played. As bingo has evolved, different objects and methods have been used as bingo markers. Early in the game’s history, beans were commonly used. Later, coloured plastic disks became the norm. Today, for bingo halls that use hard cards, markers are often little shutters that are slid over numbers as they are called. But now that most bingo halls use paper bingo sheets (or flimsies), cards are generally marked with a specialised ink pen called a dauber. While other types of pens or writing implements can be used, the rules of most bingo halls require the use of a dauber. Bingo odds involve the probabilities of winning a game of bingo within a certain number of calls. Of course, these odds vary widely by the variety of bingo you are playing (for example, 90-Ball Bingo or 75-Ball Bingo). There are many theories, systems, and strategies for beating the bingo odds (from the intensely mathematical to the use of lucky charms). For closer look at the math behind it all, check out The Wizard of Odds analyses for 90-Ball and for 75-Ball bingo. Recent statistics indicate that even outside the UK, there are over 100 million live and online bingo players around the world. Long thought of as a game for older women, bingo has undergone a rebirth, with bingo players between the ages of 18 and 34 making up about 29% of online bingo players. And with ever larger numbers of bingo players using their phones, tablets, and laptops to play the game, this number is growing! For additional fun facts and a cool infographic about who is playing bingo these days (and where), check out Who is Playing? Bingo Promo Codes are a type of bingo promotion in which you have to enter a certain code on the website in order to claim the benefit of the promotion. You can often find bingo promo codes on websites that compile them from scores of online bingo sites. But the surest way to get your hands on all the current promo codes is to subscribe to updates from your favourite bingo website (either by email or SMS), log on to the promo page of the site itself, or hang out in the site’s bingo chat rooms, where the chat hosts and your roomies will be sure to give you all the latest scoop. Everything from no-deposit bonuses, loyalty points, refer-a-friend, guaranteed jackpots, and more… bingo promotions are all the goodies that bingo websites offer to attract new players and keep them playing longer and more often. 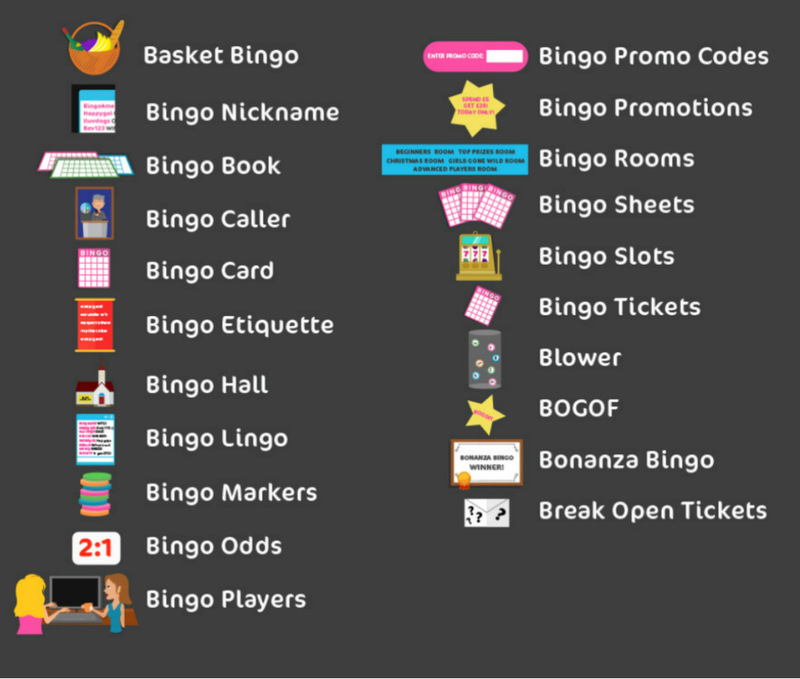 Bingo promotions are often subject to wagering requirements and other terms and conditions, so be sure to check out the fine print wherever you decide to play. In the meantime, join us on A Journey to the World of Online Bingo Bonuses and Promotions for loads of additional information. Generally, each bingo room has an associated chat room, where the players can interact with each other and the chat host. For Winkly’s own extensive exploration of bingo rooms, head on over to All You Need To Know About Online Bingo Rooms. Bingo sheets (or “tickets”) are the pages on which land-based bingo cards are printed. Usually a number of individual bingo cards (or “faces”) are printed on each sheet. Common formats include one, two, three, four, six, or nine cards per sheet. Bingo sheets are generally bound together in bingo books containing one colour-coded sheet for each game to be played in a session. Sheets in technologically-advanced bingo halls may include bar codes that are used in order to verify winning numbers. (1) A type of instant game commonly found on bingo websites, bingo slots (not to be confused with Slingo) give you an opportunity to try your luck on virtual slot machines in between bingo games (or even during them if you like multi-tasking). Bingo slots can range from the simple to amazingly sophisticated 3D works of art. (As an example of the latter, Winkly is particularly proud of our own Treasure Fair.) With some offering huge progressive jackpots, bingo slots offer a lot more excitement than the average way to pass a little time. (2) A type of slot machine sometimes found in land-based casinos that look and feel like Vegas-style slot machines but are said to be based on a virtual game of bingo being played with others in the casino. Also known as Class II slot machines. In the context of land-based bingo, bingo tickets are the pages on which bingo cards are printed (usually multiple individual cards on each page). See bingo sheets. In the context of online bingo, one bingo ticket usually refers to one individual bingo card. A machine that mixes bingo balls and chooses the ball to be called using forced air. The numbered ball is then distributed to the caller who calls the next number – bringing someone closer to bingo! 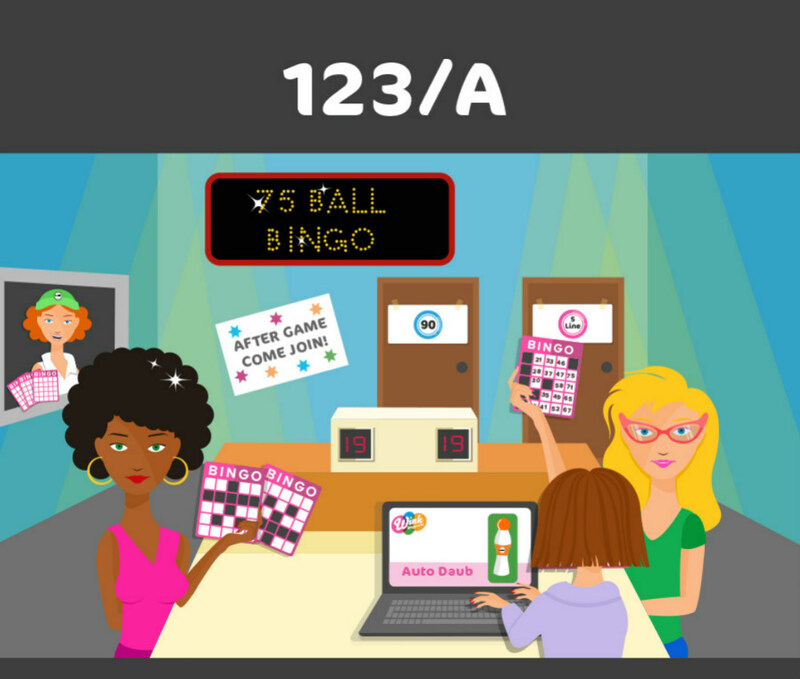 An online bingo promotion in which the player pays for one bingo ticket and gets the second one free – doubling the chances of winning. 45 to 48 balls are called and recorded prior to the start of the session. Players purchase special sealed Bonanza Bingo cards throughout the session. When the cards are opened, if someone has a coverall bingo, they win the jackpot. If no one has a bingo, the number of calls is increased by one for the next night, and the jackpot rolls over (a progressive jackpot); alternatively, additional balls are called and the first player to achieve bingo wins a consolation prize. Tickets used for type of special game played at some bingo halls or as fundraisers. The paper tickets are folded and sealed with perforated pull tabs. Certain tickets are pre-designated as winners with a winning combination of numbers, letters, and/or symbols (similar to lottery scratch-off games). In the context of land-based bingo, see admission. In the context of online bingo, the buy-in is the purchase of bingo tickets with funds (either real money or bonus) in the player’s online account at the website. The person who calls the numbers as they are drawn. The balls themselves are usually drawn at random by a bingo machine (or blower). Bingo calling has become something of an art form, with competitions to find the most gifted and some bingo callers becoming known for their charismatic styles. Online bingo websites often employ virtual bingo callers to add variety to the game (with some sites even offering players a choice of bingo caller voices). A game in which the bingo caller gets to choose the winning pattern for the game, which is usually not announced until just prior to the start of the game. (1) The actual number of balls called in a game, or the maximum number to be called for winning a jackpot. For example, if a jackpot is offered for a coverall in 52 calls, this means that a player must cover his or her entire card on or before the 52nd ball is called in order to win the jackpot. If no one wins within this number of calls, the game may continue with the awarding of a consolation prize for the first player to achieve bingo and/or the jackpot may roll over until the next session (a progressive jackpot). (2) The creative and often rhyming nicknames bingo callers in the UK use to refer to the numbers as they are called. See bingo calls. A type of progressive jackpot game in which the jackpot is won when bingo is achieved with the calling of the pre-determined cash ball. (The cash ball itself is usually drawn prior to the start of the game.) If a player calls bingo on a number other than the cash ball, he or she may win a consolation prize. Bingo in which the prize is determined by a percentage of the cash paid in by the players when buying tickets, with the rest going to the house. Gaming regulations may determine the maximum percentage of wagers that can be retained by the house, thus determining the minimum cash-in prize percentage. A common abbreviation for chat host. Side games that are played in the chat rooms alongside the regular bingo games on bingo websites. These games are announced and moderated by the chat host who explains the rules for the game and the available prizes (often in the form of bonuses or loyalty points). Generally they require players to pay close attention to the numbers being called in the regular game and a quick response on keyboard! The person who monitors and moderates a chat room on a bingo website. Usually an employee of the site itself, the chat host keeps the room lively and full of fun. The chat host also runs chat games and keeps players up to date on the website’s various events and promotions. Shorthand abbreviations used by roomies in a chat room when they are talking with each other. Considered incomprehensible to the uninitiated, it’s actually quite easy to pick up and makes it easy and fun to chat even when you’re playing bingo on your mobile phone. AFAIK it’s the way to go! A virtual room connected to an online bingo room where players gather, swap stories and gossip, catch up between games, encourage each other, and compete in chat games together. Each chat room is monitored by a chat host, who facilitates that chat games and encourages conversation and community. In computer terms, a chat room is just an interactive text box, but to many online bingo aficionados, it’s the main reason they log on. Some roomies have become lifelong friends, and the sense of community is anything but virtual – it’s as real as it gets! See the full list of bingo lingo here. The first number called at the beginning of a session becomes the lucky number. Every time the lucky number is called during a game (without anyone calling bingo on that number), money is added to the jar. When someone does hit bingo on the lucky number, he or she wins the money in the cookie jar. Usually the cookie jar can only be one during the play of regular games. Also known as a “blackout,” a coverall is a pattern in 75-Ball Bingo that requires that you cover every number on your card in order to win (in other words, covering all 24 numbers on your card plus the free space). Usually, it takes 50 to 60 calls (of the available 75) to achieve a coverall. Therefore, coverall games often offer a jackpot prize if someone is able to achieve this feat in a predetermined number of relatively few calls. For example, a jackpot may be offered if someone hits bingo in just 45 calls. If no one wins in this number of calls, the jackpot may rollover as a progressive jackpot and/or the game may be continued with a consolation prize offered to the player who achieves bingo in the fewest number of calls. Some bingo halls also make electronic dauber systems (such as TED) available, making it possible for players to play many more cards at once. Take a look at Top 10 Facts About Bingo Daubers to get up to speed on all your dauber trivia. An online bingo player funds his account on a bingo website with deposits. Depending on the website, a player can make deposits via credit card, debit card, and online money transfer services such as PayPal and Neteller. Deposit bonuses are a type of bingo promotion offered by online bingo sites to encourage players to make deposits and fund their bingo accounts. Deposit bonuses usually multiply the amount of a player’s actual deposit by a certain percentage up to a stated maximum (for example, 200% of your deposit up to £75). Many bingo sites offer initial deposit bonuses and redeposit bonuses (with the initial deposit bonus as the most generous/enticing). Often, deposit bonuses differentiate between bingo bonuses and instant game bonuses, and deposit bonuses are almost always subject to wagering requirements (which can vary significantly by website). For lots of additional details along with example deposit bonus calculations, join us on A Journey to the World of Online Bingo Bonuses and Promotions. A winning pattern in 75-Ball Bingo requiring that a player complete two lines in order to win (any combination of horizontal, vertical, and diagonal). Some bingo halls refer to the first game of a session as the early bird game (see also warm-up). Others use the term to refer to a game played prior to the first game of the regular session (in which case, the cards for this game are usually purchases outside the regular admission pack). A system offered at some bingo halls that checks numbers as they are called across multiple bingo cards and marks them for the player. This makes it possible for a player to play a large number of cards at one time, without worrying that he or she will miss marking a called number. In some locations, the player must manually enter the called number into the electronic dauber, allowing it to check the cards. In other locations, the unit is connected to the hall’s bingo management system, so it can mark cards without any action at all by the player. Halls that offer electronic daubers usually charge a rental fee for their use and limit them to one per player. The most widespread of these systems is called TED, and this name (or that of its manufacturer, G.T.I.) is sometimes used as a general term to refer to electronic dauber systems. An individual bingo card or playing area as described when appearing on a bingo sheet of multiple cards. For example, a sheet that includes 9 individual bingo cards is said to have 9 faces. One-time use bingo cards printed on thin sheets of paper, typically with a number of faces printed on each sheet. Today, most bingo halls utilize flimsies for all games (both regular and special), with the sheets for the regular games bound into bingo books/admission packs. A pattern requiring that the four corners of a 75-Ball Bingo card be covered in order to win. The completion of all three lines in a game of 90-Ball Bingo. 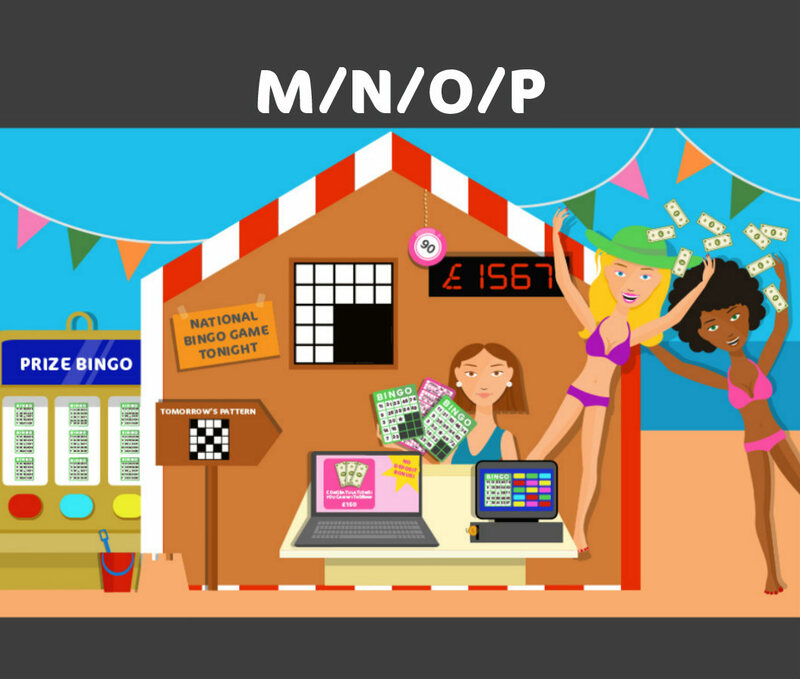 A player who has made an actual deposit to an online bingo account (exclusive of bonuses he or she has received from the website). It is common practice for bingo websites to limit certain bingo rooms and promotions only to funded players. An electronic display, often part of or attached to the bingo board. The game board is essentially an electronic representation of a bingo card that shows the winning pattern for the game being played. 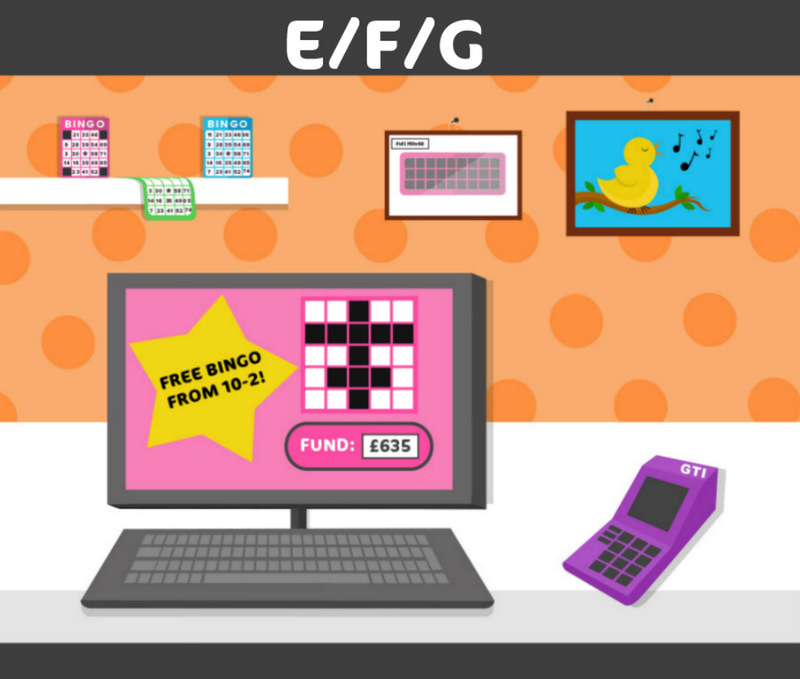 The online bingo equivalent is a section of a screen in the bingo room that shows the pattern being played. A bingo card printed on heavy cardboard, often designed with small shutters to cover the numbers as they are called. Historically, these were used in bingo halls for the regular games in the session, as distinguished from the flimsies sold for special games. However, today, hard cards are becoming increasingly rare, as most bingo halls have begun utilizing bingo books made up of one-time-use bingo sheets for both regular and special games. A 75-Ball Bingo game whose winning pattern requires completion of straight vertical or horizontal line that does not include the free space. (1) Similar to the exclamation of “Bingo!” In some UK bingo traditions, players shout “House!” upon winning. 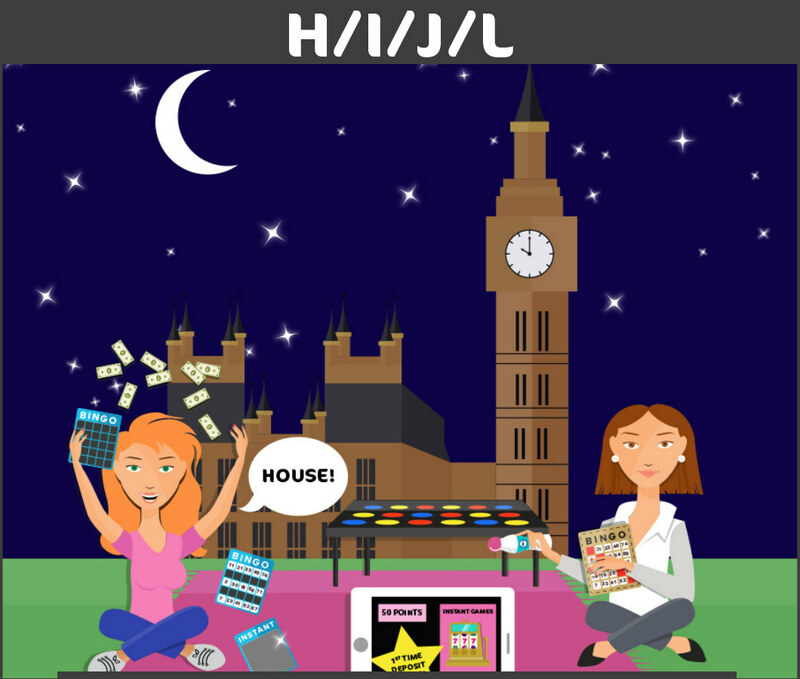 In some places, it is customary to shout “House!” only upon completing all three lines (or a Full House) in a 90-Ball Bingo game (whereas the term “Line!” is used upon completing one or two lines). In others, “House!” is called for completing one, two, or three lines. Legend has it that the Queen calls “Palace!” instead of “House!” when she plays bingo. (2) The owner/operator/proprietor of a gambling establishment or casino. In the context of bingo, the house is the bingo hall or the bingo website. A type of deposit bonus offered by bingo websites to encourage new players to make first-time deposits to their accounts. Usually designed to multiply the amount of the player’s deposit by a specified percentage (up to a certain maximum), an initial deposit bonus is likely the most generous deposit bonus offered by a website. Initial deposit bonuses are almost always subject to wagering requirements and are generally designated as either bingo bonuses (which can be used only for playing bingo) or instant-game bonuses (which can be used only for playing instant games). For loads more information about all types of bingo bonuses, check out A Journey to the World of Online Bingo Bonuses and Promotions. Used in some bingo halls for playing mechanised cash bingo. These plastic 4×4 bingo cards are built into the table tops, and numbers are covered with small plastic chips as they are called. A type of break open ticket that includes printed bingo cards and pre-printed “called” numbers (often hidden by scratch-off film). If the player achieves bingo when the hidden numbers are revealed, he or she wins. Games offered by bingo websites in addition to bingo. Instant games commonly include bingo slots, casino-style games like blackjack and roulette, and virtual scratch-off games. Players on bingo sites often enjoy instant games between bingo games, while they are waiting for the bingo action to start. A cash prize, generally larger than the usual bingo prize. Commonly won by completing a coverall, full house, or other difficult pattern within a designated (relatively small) number of calls. A jackpot can be a guaranteed prize, but most cannot be won unless a player wins under the specified jackpot conditions. Many bingo jackpots are set up as progressive jackpots. Like an online bingo site’s “frequent flyer” plan. Frequently, a points-based program that credits players with points each time he or she buys bingo tickets on the site. Once a player collects enough points, he can redeem them for additional bingo tickets or convert them to funds in his account. Often, there are many additional ways players can earn loyalty points, including winning chat games, referring new players to the website, etc. The primary game (or games) played in a bingo session, involving paper or electronic tickets typically purchased before the bingo session starts. 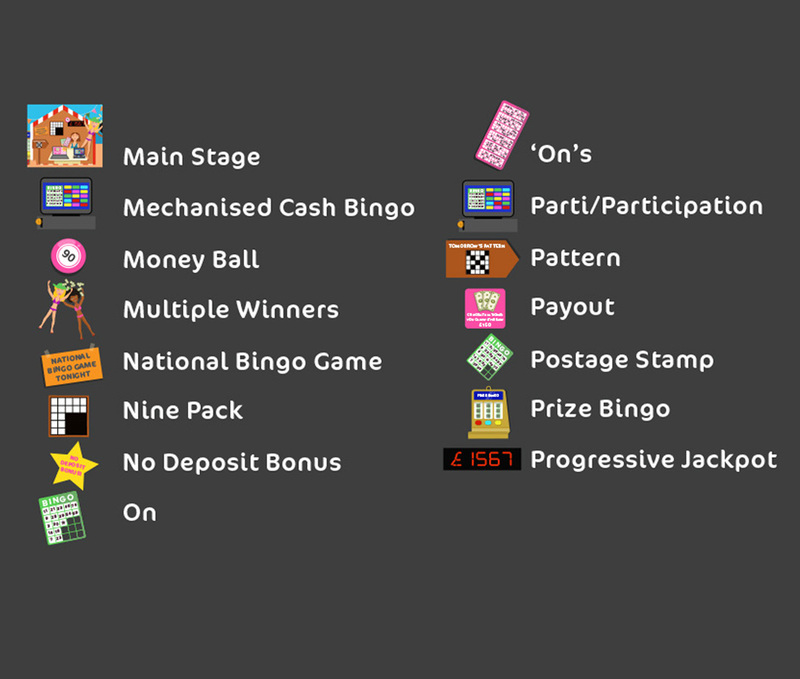 A form of participation bingo played in many UK bingo halls in addition to main stage bingo. Mechanised cash bingo features 80 numbers and reusable bingo cards of 4 rows and 4 differently-coloured columns (either inlaid cards or shutter boards). Players buy into the games by inserting credit into a coin slot, and the numbers are called very quickly by an automated caller. To increase interest and make available prize money greater for each game, mechanised cash bingo is often played in large games of many bingo halls linked together. In the context of online bingo, the minimum buy-in is the smallest number of bingo tickets a player can buy in order to be eligible to play a game. A number drawn immediately before certain games. If, during that game, a player hits bingo when the money ball is called, his or her winnings will be doubled. Two or more players hitting bingo in the same game on the same call. In this case, the cash prize for the game is divided equally among all the winners. When a game has multiple winners, it does not make a difference which player calls bingo first. A group of 6 to 8 electronic bingo terminals grouped together in a mushroom-like shape. A lottery-like game of bingo played twice each day in the UK – every day of the year other than Christmas Day. The game is played in 100 to 200 bingo halls linked together by computer, thereby offering the possibility of huge prizes. The player who hits a full house on the fewest number of calls in each bingo hall wins the Club Prize. (The National has no one- or two-line wins.) The player who wins in the fewest calls across the country wins the National Prize. If a player winning the National Prize hits bingo on a number highlighted by a star on the winning bingo card, he or she wins the National Jackpot Prize. An amount of bonus money offered by some bingo websites to a new player even before he or she makes a deposit. Sometimes referred to as “welcome bonus” or “new-player bonus". A new player can generally receive this bonus by registering for the website and providing some basic contact information. the number of tickets they can buy per game. Additionally, no-deposit bonuses are generally subject to wagering requirements. 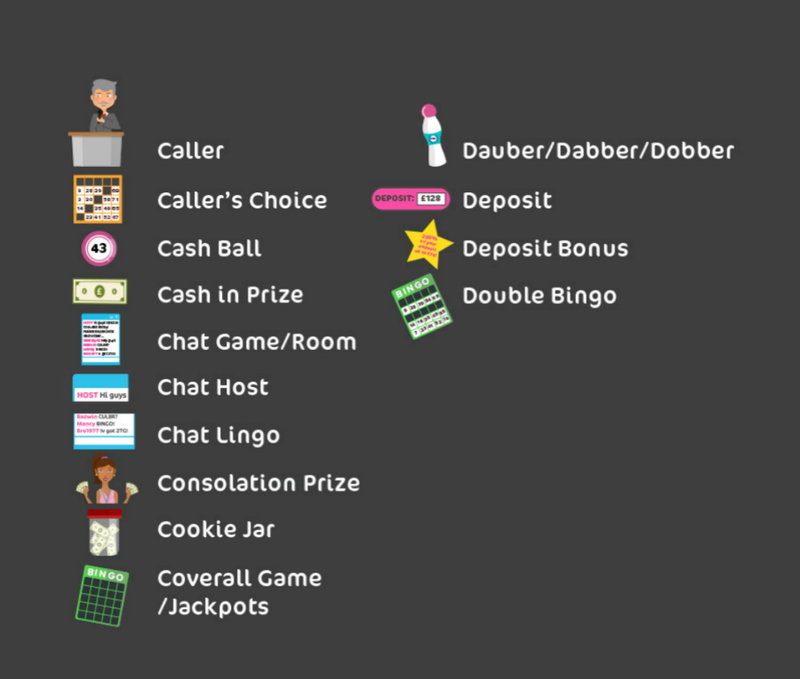 Despite the limitations and requirements, no-deposit bonuses can be a great way for new players to try out a bingo website and decide whether or not to make a real-money deposit. For detailed information about the endless variety of bingo bonuses and promotions available on bingo websites, take a look at A Journey to the World of Online Bingo Bonuses and Promotions. A pattern is said to be “on-the-way” when it is played in the same game as a coverall. In this type of game, the player who hits the pattern is the first winner; then the calls are continued until someone hits the coverall. A common nickname/abbreviation for participation bingo. A type of slot bingo/cash bingo in which the cash prize is determined by a percentage of the money paid in by the players. Mechanised cash bingo is the most well-known participation bingo game in the UK. The shape that must be covered in order to win a 75-Ball Bingo game. In bingo halls, this pattern appears on the game board. In an online bingo room, the pattern appears in a designated area of the screen. (1) An amount that is withdrawn from an online bingo account. See withdrawal. (2) The percentage of the money paid in by players that is eventually paid out as winnings. For example, if the players of a bingo game bought a total of 100 cards for £1 each, and the winners received a total of £50, the payout is said to be 50%. A winning pattern in 75-Ball Bingo consisting of a 2×2 square in any of the four corners of the card. A type of bingo popular in some bingo halls and British seaside resorts. Generally played on bingo slot machines, winners receive points, vouchers, or tokens instead of cash prizes. These can then be redeemed for merchandise prizes in the arcade shop. A type of bingo promotion in which the player is entered into a random drawing to win cash or merchandise prizes. The number of entries the player receives is generally based on the value of bingo tickets he or she purchases during a defined period. A jackpot that increases until it is won. Jackpot games can vary in their rules, but generally involve achieving a coverall, full house, or other difficult pattern within a fixed number of calls. Progressive jackpot games are typically specials that require a separate buy-in. A lottery-type game played in some bingo halls and for organizational fundraisers in which the player pays for the opportunity to “punch out” a hidden paper game slip from a hole in a wooden board. The board consists of many holes/game slips – some of which are winners based on the numbers and symbols appearing on them. A quickie (also known as a “blowout”) is a coverall game in which the numbers are called out as quickly as possible. Usually played as a special outside the regular session. In some bingo halls, players can purchase bingo books of different colours. The colour of the bingo tickets the player is playing determines the amount he or she is eligible to win. A rainbow pack is a ticket package or book that includes tickets of different colours – allowing the player to play for multiple prize denominations at once. A type of deposit bonus offered by bingo websites to encourage players to make continued deposits to their accounts. Similar in structure to an initial deposit bonus, it is usually designed to multiply the amount of the player’s deposit by a specified percentage (up to a certain maximum). Generally, though, reload bonuses do not have quite as generous terms as initial deposit bonuses. As are initial deposit bonuses, reload bonuses are almost always subject to wagering requirements and are generally designated as either bingo bonuses (which can be used only for playing bingo) or instant-game bonuses (which can be used only for playing instant games). Some sites regularly offer reload bonuses on all deposits; others only offer them periodically or require entry of a promo code at the time of the deposit. To learn more about all types of bingo bonuses, check out A Journey to the World of Online Bingo Bonuses and Promotions. Random number generator. A computer program that randomly generates the bingo numbers to be called, an RNG is essentially the digital equivalent of a bingo blower or ball-mixing basket. 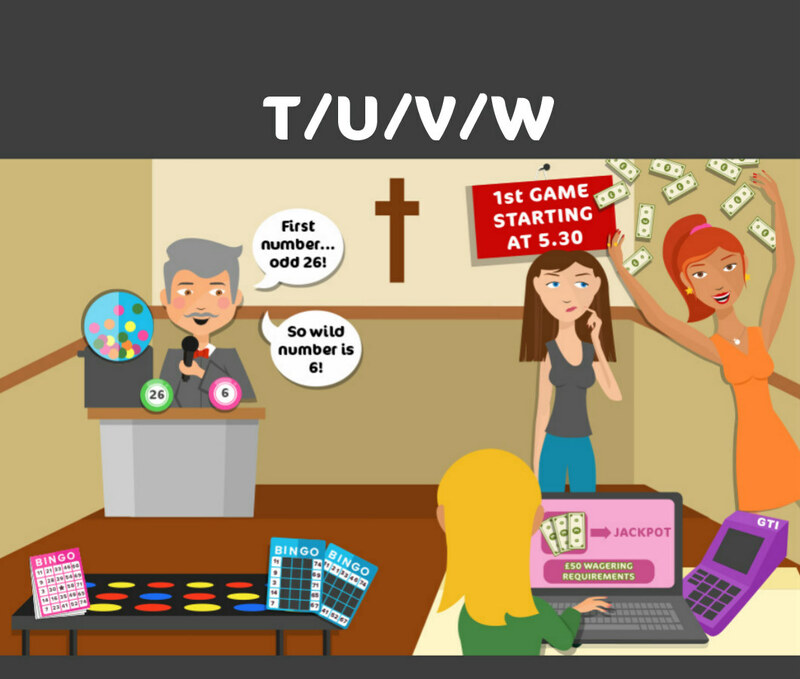 All online bingo sites rely on random number generators to determine the numbers that are called during a game. Players who are chatting together in a bingo room/chat room. One of the security devices in place to ensure the integrity of the game and verification of the winner, the serial number is the unique number printed by the manufacturer on each set or series of bingo cards. The same serial number is printed on each ticket or sheet in the series. The most common series are 6,000 and 9,000. In bingo halls, a session is a program of regular games played in succession. A session may be broken up by intermissions and may also include special games played before, in-between, and after the regular games. A typical session requires the purchase of an admission pack. Scheduling can vary widely between bingo halls, and it is common for a single evening of bingo to include a number of individual sessions (such as early, main, and late.) A typical main session includes between 12 and 20 games and takes around an hour to play. Used in some bingo halls for playing mechanised cash bingo. Shutter boards are hand-held, plastic bingo cards laid out in a 4 row by 4 column format. They get their name from the small shutters that are closed over the numbers to mark them as they are called. A winning pattern in 75-Ball Bingo requiring that a player complete one horizontal, vertical, or diagonal line in order to win. A game played in a bingo hall outside the regular session. The tickets for specials are generally sold on the floor during the session – separately from the session’s admission pack. (In some locations, admission packs do include tickets for some of the specials to be played during the session.) Specials often offer different types of games and various jackpots and prizes higher than those of the regular games. A variation of regular bingo that is played on a 3×3 card and utilizes just 30 balls. Numbers are called very quickly and a player can win in as few as three calls. Usually played before or after a regular session. An electronic dauber system that has become so prevalent that the name TED is sometimes used as a general term to denote all electronic daubers. You may also hear people refer to a TED system as a G.T.I., which are actually the initials of its manufacturer, GameTech International. A lottery-like game played on a mechanical table board bingo device containing permanent bingo boards and shutters. Table board bingo events are often held as fundraisers in conjunction with regular bingo events. A variation of a coverall game. If the first number called in the game is even, all the even numbers on the cards are considered “wild” and can be marked. If the first number called is odd, all the odd numbers on the cards can be marked. After the first call, the game continues until the winner covers all the spaces on his or her card. A winning pattern in 75-Ball Bingo requiring that a player complete three lines in order to win (any combination of horizontal, vertical, and diagonal). An extra amount that a player must pay in advance in order to be eligible to win special prizes or jackpots. If a jackpot requires validation and the player meets all the other conditions for winning but hasn’t validated, he or she would forfeit the jackpot. For an example of how validation works and a sample calculation of whether or not it’s worth it to validate, see Bingo – When to Validate. Wagering requirements (also referred to as “playthrough requirements”) specify a certain amount of money that a player is required to wager before he or she is able to withdraw winnings from his online bingo account. Wagering requirements arise just about every time a player accepts a deposit bonus on a bingo website and are usually measured as a multiple of the bonus amount (and/or the amount of the related deposit). For all the ins-and-outs of wagering requirements, be sure to check out Wagering Requirements For Those In The Know. A wild number is a number that all players are allowed to mark if it is found on their cards. Rules for determining wild numbers among bingo halls and games vary, and not all games feature wild numbers. One common method for determining wild numbers is based on the last digit of the first call of the game. For example, if the first number called in a game is 25, all numbers ending in 5 will be considered wild for that game. A winner-take-all game is a game in which the winner wins 100% of the money paid in by the players, with the house keeping none of the proceeds for that game. WTA games are usually coveralls. The last game of a bingo session.